Yes, I know there's only 4 CDs here. Somehow, my other favourite- Deja Entendu by Brand New- has gone AWOL. I've already re-bought it once because I lost my first one! Now I've lost the second one too. Sigh! Picking up these CDs to take these photos was the strangest sensation. It's been years since I held a CD and the feeling of holding a stack of CD cases in your hands, tapping the covers with your nails, is so nostalgic. Try it! It took me right back to my teenage years- I haven't played these CDs for 6 years. Of course, I imported them to iTunes as soon as I got my laptop and later stuck them on my iPod, so I still listen to them all the time. It's a little sad that teenagers of today won't have the physical memories that we do. So here's my top 5 albums of all time. It will come as no surprise to you that they're all emo classics and I bought every single one between 2005 and 2006. I'm so predictable! Well, there had to be a My Chemical Romance album here somewhere! I bought this way back in 2005 and I still remember putting it on my Walkman as soon as I got on the tube. I have a really vivid memory of sitting on the Circle Line listening to Helena for the first time. I don't think there's any album that takes me back to the feeling of being 16 like this one does! My best friend Marie was way ahead of me on this one. I was too sweet and innocent to listen to rock music when I was at school but Marie was already becoming an emo kid. We'd hang out in the drama studio at lunch and she'd always put this album on. A year later, in mid-2005, I bought my own copy. That summer, Marie and I would spend hours lying side-by-side on her bed, listening to this album on repeat in the dark. It's true emo at its best. 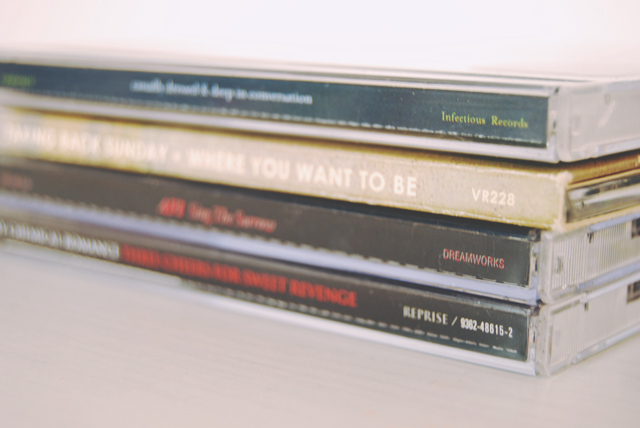 I was a latecomer to Taking Back Sunday. I knew of them- I remember chatting to a boy I went to school with outside Asda one time and him saying to me "You're not a real emo unless you like Taking Back Sunday" (Aah, the nostalgia of elitism! ), and being mortally embarrassed by my little brother, then 15, loudly asking "Who's this?" when they supported Green Day at Milton Keynes. However, it was only when I started going to the local rock club at the end of 2005 that I first heard Decade Under the Influence and actually paid attention to the ultimate emo band. Their lyrics were a revelation to me- It was like they were living my life! Again, Marie was miles ahead of me with this album. She'd listen to it all the time but I didn't show much interest in it until I started uni in 2006. Suddenly, these morose songs, which I once neglected due to my love of catchy melodies, made sense to me. I still think it's one of the most beautiful albums of all time. Everything about it is pure perfection. Ah, our home-grown emo kings! In the UK, it was pretty much accepted that you couldn't be emo without listening to Funeral for a Friend. Of course, Juneau was the song that alerted me to them and, as soon as I decided I was emo (yes, it was a conscious decision! ), I went out to buy this CD. Somehow, even today, I see Funeral for a Friend all the time. I've seen My Chemical Romance 16 times, but I think I may have seen these guys even more. I don't know, I've lost count! It's a bit of a joke with me and Laura that I'm always seeing them! Speaking of which, Marie- We need to sort out those tickets for next month! To give you a little rundown on 2005-era emo, I've chosen the stand-out track of each album. Rip up your fishnets, don the red eyeshadow and enjoy! 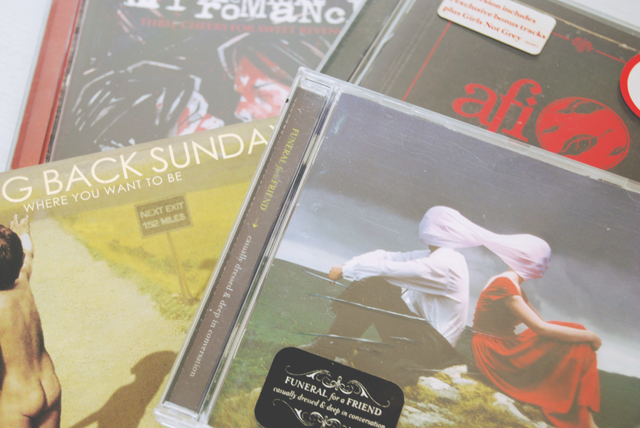 I've simply loved the my chemical romance and funeral for a friend's albums! They remind me my young age! shah! love! i may have screamed when i saw the my chem album, um.. I love this post! I remember getting into My Chemical Romance when they brought the Black Parade out before that I was strictly pop punk (Blink etc) and then I listened to Three Cheers became an emo and wondered why I'd never heard them before haha. Casually Dressed though, is one of my all time favourites, I'd love to see Funeral For a Friend again. Love this post so much haha. Ahhh I used to listen to My Chemical Romance as a teen! It'd be soooo difficult to come up with my five favourite albums - I have too many! ME AND MY FRIEND VICKI LISTENED TO MCR IN WORK TODAY (BLACK PARADE - IT WAS STILL AS AWESOME.) AND I FELT SO YOUNG AGAIN! Sadly, I completely missed the Brand New phase and i've only ever heard two songs! I also never understood the afi thing, Liam loved them but I never really liked them. Well clearly Liam is much cooler than you! I can't be your friend anymore. Soz. Okay we need to be BFF. The majority of these are also some of my TOP albums of all time!!! You have the best taste in music! ahh 3 of those are in my all time favourites too, Where You Want To Be, Deja Entendu and Casually Dressed are literally the best albums ever, I still listen to them all the time!!!! 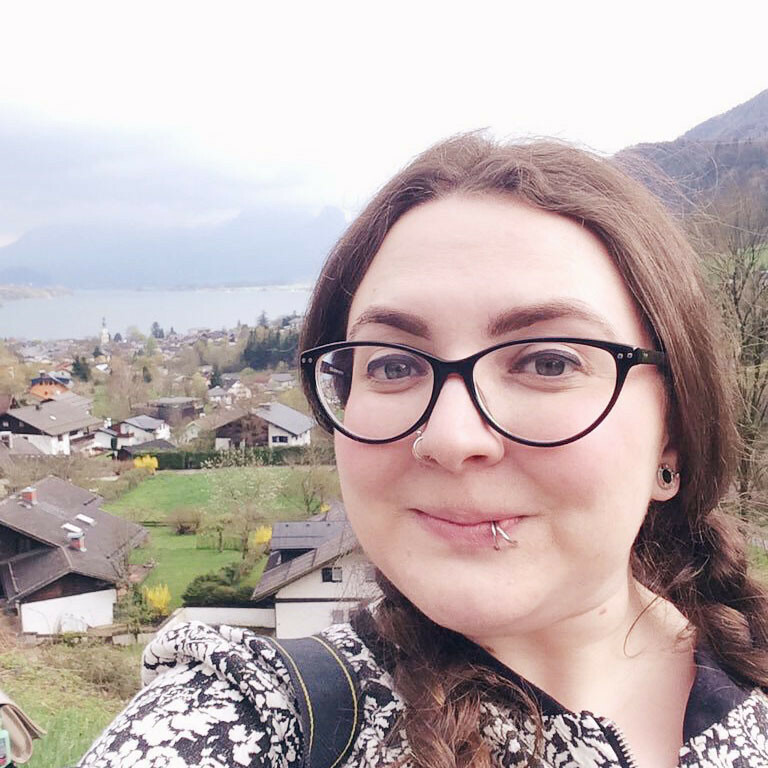 Book Review: Ooh, What a Lovely Pair!